WWE NXT's fourth live special had a lot to live up to, following on from the red hot Arrival and Takeover, and the decent Takeover: Fatal 4Way, Takeover REvolution couldn't afford to dissapoint. 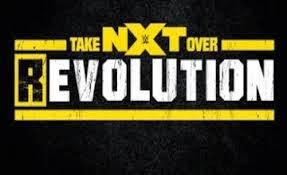 Did Takeover: REvolution live up to the hype? Could it reach the heights of Arrival and the original Takeover? Let's find out shall we?! You probably think this section is about you. 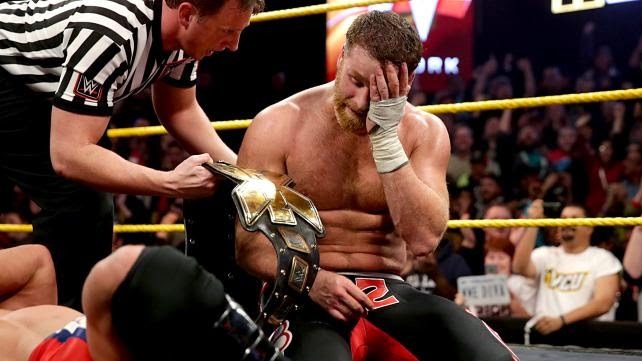 Well, it's about Sami Zayn and Adrian Neville who main evented the show with an exhilariting NXT Championship bout that had the crowd on the edge of their seats from the outset. This was a drama filled, rollercoaster of technically sound wrestling action that topped of the show perfectly. The two men moulded together nicely, it was clear that the two had made the most of their numerous matches before WWE TV Tapings and at WWE and NXT house shows over the past year. The sequences of action flowed very smoothly indeed, without ever feeling over rehearsed, with a series of action ending in an Blue Thunderbomb dropped from an Electric Chair position from Zayn being a highlight amongst highlights. Whilst there was a number of impressive moves (REVERSE RANA!) it was in the WWE main event style of story telling that this match really came into it's own. Neville working to ground Zayn early on made perfect sense, with the commentary team working hard to get over the reasons for this, with the crowd being so into Zayn that they stayed hot throughout a series of main event chinlocks from Neville. This put down a solid foundation for a Zayn comeback, with the pace quickening and the match going back and forth with a series of well worked near falls for either man, with Zayn coming close with a Koji Clutch and the aforementioned Reverse Rana from Neville being amongst the best efforts. Other strong story telling elements included Neville rolling out of the ring after a number of big moves from Zayn, most notably a Three Amigos that closed with a beautiful half and half suplex. This got the crowd even more behind Zayn, as the frustration on Zayn's face emanated through the screen, this also allowed Zayn to reach into his impressive catalogue of aerial offence. Zayn's moral dilemma whilst holding the title belt, with referee having been bumped for the second time, was also strong, if not a little too long, but worked nicely into the closing sequence, rounding off Zayn's story well, as he went on to pick up the win with a Exploder Suplex into the turnbuckle, followed up with a Helluva Kick for the pinfall. In many ways, this felt like the Performance Centre coming full circle, as Zayn and Neville showcased that their Indy stylings could be meshed with WWE's sports entertainment style, with both men looking more than ready to make the step up to the main roster, more so than at any point during their run in Developmental. Zayn's celebration was given more than enough time to settle in, something that is sometimes lacking from WWE title changes, whilst a storyline twist that saw the debuting Kevin Owens attack Zayn post match with a Powerbomb onto the ring apron seemed to set up the main event for the next NXT special. It was terrific to see two females competitors featured so heavily on the show and Charlotte and Sasha Banks did everything they could to make sure that NXT continues to treat it's females this way going forward. A big improvement on Charlotte's bout with Bayley on the previous special, this was an engaging and athletic encounter, with both ladies character work being allowed to shine through. Sasha Banks' character in particular came across very well, with her constant mocking of Charlotte and her father Ric Flair, making it easy to dislike The Boss of NXT. She seemed to have everything about the character thought out, and this played well against Charlotte's more athletic based approach to the match. I was, however, a little disappointed to see her pulling out a suicide dive, mid-way through the match, as it did seem a little out of character and out of place during this match. A sequence where Banks repeatedly went for covers on Charlotte helped to make up for this however. At the times the bout was not quite as crisp as it could have been and there were a few communication errors, with the two rushing a few of the earlier sequences. However, these errors were quickly ironed out and the two finished the match looking more than comfortable in the ring together. Charlotte landing on her feet following a missed Moonsault and turning it into a Senton, followed up by a strong closing sequence ending up with a Top Rope Natural Selection was some of the strongest women's action WWE has put on in 2014. With these two performers fitting together nicely in the ring, it would be a shame for their feud to finish her, although with Charlotte picking up a clean victory it's difficult to see where they can go from here. Becky Lynch could make the step up ahead of her BFF, although it's difficult to see how Sasha would take the backseat in the feud. Perhaps Bayley will be thrown back into the mix to keep things interesting? The division could definitely do with a fresh injection of talent with Carmella and Alexa Bliss the only other two active women on the roster. The highlight of the undercard was a well booked tag team encounter pitting The Ascension against relative NXT newcomers Hideo Itami and Finn Balor. Of course, Balor's new paint job was a big talking point heading out the show, but I was equally impressed with both Konnor and Viktor who did more than enough opposite two internet favourites to make me take notice. Viktor, in particular, was part of some nice wrestling opposite Balor. For me this was the strongest Ascension bout to date and to suggest that Itami and Balor carried the bout would be naïve, as the two put in more than their fair share in order to allow Itami and Balor look the best they possibly could. The build to the hot tag was done nicely, with Itami working the face in peril role, with a refreshing scrappy style. Itami always looked like he was trying to make the tag, whilst Konnor and Viktor looked incredibly comfortable whilst in control of the match, which made for a great moment as soon as Itami eventually made the tag to Balor. This is where the match really got going with both Itami and Balor able to show off an excited arsenal of offense, with a handful of false finishes thrown into the mix. Towards the finish there was a number of momentum changes between the two teams, including a huge pop for a GTS attempt from Itami, before Balor hit Viktor with a Pele Kick, Itami hit Konnor with a Busaiku Knee Kick and the pair hit Double Double Stomps with Balor picking up the pinfall victory. In another tag team match, The Lucha Dragons defended the NXT Tag Team Championships against The Vaudevillains, in a rather basic bout. It was a very paint by numbers match, that was livened up by some unique offense by Kalisto and Aiden English who both looked like the stars of their respective teams when given the chance. Sin Cara on the other hand looked like he'd rather be anywhere else, with almost everything the former Hunico did in the ring looking sloppy and lethargic. With the Lucha Dragons picking up the victory, I'm not quite sure what's next for the paper thin NXT Tag Team division. Before he turned on Sami Zayn, Kevin Owens was in action against CJ Parker. Owens couldn't have hoped for a better debut, as he looked incredible ploughing through Parker who certainly isn't a crowd favourite at NXT. An impressive series of offense including a Tope Conhilo, Pumphandle Neckbreaker and Pop Up Powerbomb allowed Owens to quickly get over his style to anyone who hadn't seen him before. Parker's minimal offense did lead to Owens getting busted open, which added even more to Owens image and the match itself. Baron Corbin also continued his run of squashing opponents as he ran through Tye Dillinger in a matter of seconds. Finishing off Dillinger with his End of Days move, Corbin is beginning to feel like a one trick pony, and whilst it is fun to see him destroy opponents week after week, he's going to need to show something else if he's going to move forward as a WWE wrestler. The feud teased with Bull Dempsey doesn't fill me with hope for Corbin's future. For me, this was the strongest NXT special to date, with almost every element of the show delivering in spades. The main event was the Match of the Night no doubt, with Neville and Zayn presenting a great mash-up of Indy and WWE styles, whilst the Women's Championship bout and Itami & Balor vs. The Ascension working nicely in supporting roles. Kevin Owens debut also worked well, presenting a destructive force in ring, whilst thrusting him straight into a main event storyline. The only match that felt like it struggled was the Tag Team Championship bout and even that had Kalisto and English shining through. This show get's a big thumbs up from me, and WWE's next PPV offering TLC will have to work extremely hard to better this two hours of action.